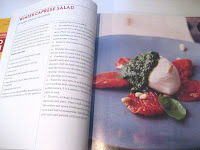 Browsing thru Mario Batali's cookbook yesterday, I noticed a recipe for Winter Caprese Salad. Since it was a miserable day in the Northeast, filled with rain, snow and sleet (and it's not even Halloween yet! ), I wanted some of my summer back! (yeah, good luck with that). I had my precious roasted plum tomatoes that were roasted in August, which are almost gone, some of my summer basil pesto (which is also almost gone), but no basil leaves left under the slush, but I did have some arugula! So, what the hell, why not call this salad "Not Quite Winter Caprese Salad". I serve fresh mozzarella all year long. I serve it with roasted peppers and chopped olives in the winter months, and since basil is now available all year long in the supermarket, I can make pesto anytime I like. 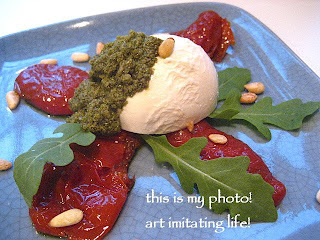 This is life imitating art for sure..........here is my "Not Quite Winter Caprese Salad", and the next photo is Mario's. Batali is one of my favorite chefs and foodies because he has such passion, not only for the food and ingredients used, but also for Italy, the country & the land. His love for the people and even the pigs that the prosciutto comes from, really shows in his cooking. I love people that are passionate about what they love! Whatever that may be! This looks great and your picture looks even better than Mario's. I like the substitution of arugula for basil. The peppery taste would definitely add zing to this yummy dish. Your pic is better!!! nice photo :) my brain is thinking it would be fun and tasty to have half roasted red pepper along with the roasted tomato. oooh, I can't wait to go home and reclaim a little summer! 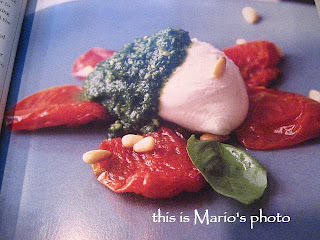 The salad looks great, and I agree that your photo is better than Mario's. Food stylist... now that's an idea for a career... you're half way there. 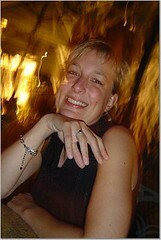 Your photos are always excellent, design - perfection, ingredients - luscious. Amazing what a "blog" can lead to. Great plating! Your roasted pepper and olive version sounds fantastic too. I like your picture better than Mario's, too! Great job! Believe it or not, I saw a crop of beautiful ripe San Marzanos in someone's back yard in Florence last week! I was SO tempted to stop the car and pick them! The salad looks great, I'm sure those tomatoes are yummy! I would LOVE your basil pesto recipe! I add roasted peppers to the mutz, however, then it is no longer a Carpese Salad!! (has to have tomatoes!). Mix all ingredients in food processor for a few pulses, and then add your olive oil. About 1/3 cup, or until the consistency you like! You can add more or less of anything. I never measure and it is always great! Freezes beautifully, and I use it on every sandwich, even tuna! fancy! this looks wonderful. i can never get enough caprese salad. At first I thought those were roasted peppers which are a great sub for tomatoes this time of yr. Pesto would work here too in the absence of fresh basil. Looks delicious. I love roasted tomatoes. This recipe has great colors and flavors! Move over Mario, you got some competition!! Stacey, yours looks better than the book! Seriously! What do you think of his new show? I hear negetive things about it because all the talking they do, but I don't care, I DVR it every Sunday, I agree... He's got passion! You win the picture contest. Looks so delicious! Not quite, looks quite delicious to me! If I had this salad for a meal I would be a happy happy girl. Mario is one of my favorites too. I love the winter caprese and make it often this time of year. Yours looks delicious.